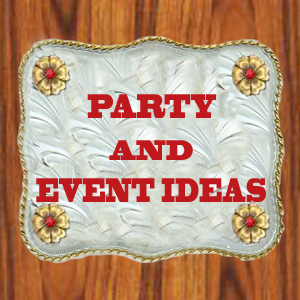 Find western cake toppers with cowboys, cowgirls, horses and other western themes. Western wedding cake ideas. Well,.... it looks like someone is thinking about having a Western Themed Wedding. 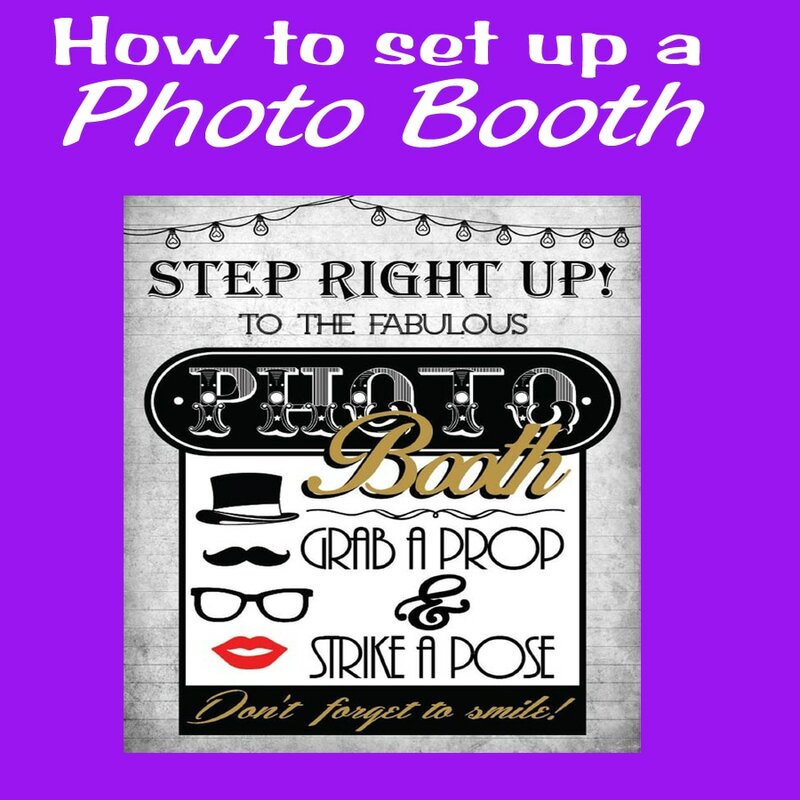 Yep, I caught you surfing the web and looking for everything to make to make your wedding and reception echo your love for horses, cowboys, cowgirls, and all things country. There are some pretty special Western Wedding Cake Toppers assembled on this page for you to look at. 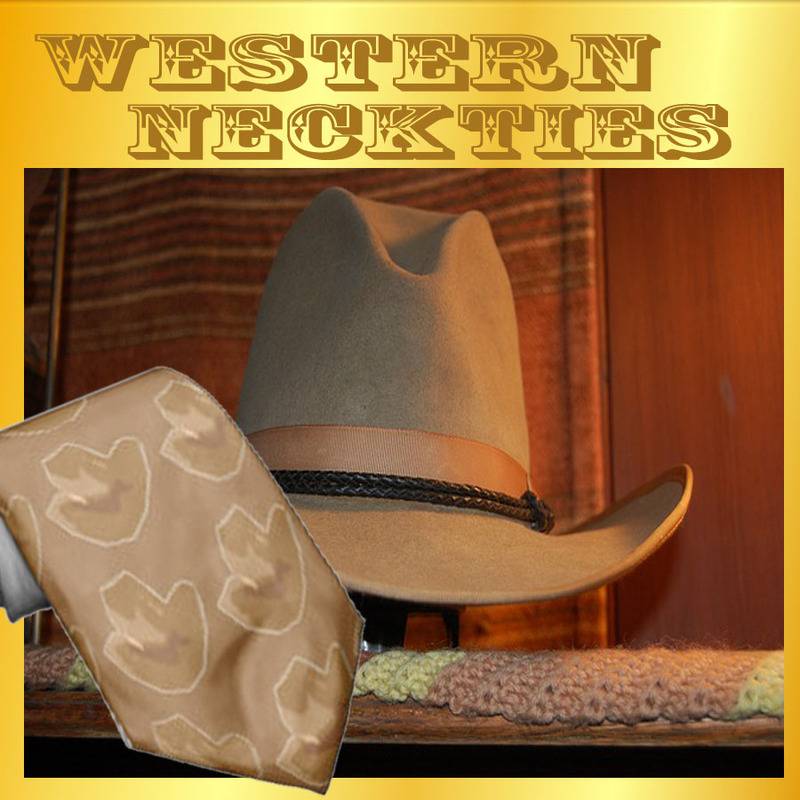 Many of these can also be used as table decorations also at any western themed party or even given as a western gift. I have also included some pretty unique ideas for Western Themed Cakes and CupCakes. These could be used for a Grooms Cake or at any Western Themed Party. Have a look, you may be inspired. I love these cake toppers with Cowboys Cowgirls and Horses. They look like the statues or figurines that are available for western home decor except these can be used on top of a cake. It wouldn't have to be a wedding cake either. How about an engagement party or anniversary party cake topped of with one of these western pieces. This is one of my favorites. It is made of hand cast resin with a rustic look. This cowboy and cowgirl on horses cake topper is 6 1/2 inches tall. It is made of polyresin with an antique silver color coating. These are made of laser cut steel with cowboy, cowgirl and horse designs. They are lovely and could also be used at the sign in table and make a nice keepsake that can sit on the shelf as home decor later. This sweet couple stands 4 1/2 inches and is made of porcelain except for the felt cowboy hat and rope. You can have this cake topper engraved by the maker when you order. The top of the fence is blank now so you can have Mr. and Mrs. Jones or other text added to it. The couple part is porcelain with other western accents. This white porcelain piece is available with silver horseshoes or gold horseshoes. It is 5 1/2 inches tall. A tractor cake topper will fit right in with a western theme wedding. It has a couple sitting on the tractor and the bride has on cowboy boots. It is made of porcelain and is 5 inched tall. Getting hitched is an western wedding term for getting married. ​This is a 4 1/2 inch cake topper that has a getting hitched sign and other western decorations. Here is another getting hitched themed cake topper. It has a horse shoer or ferrier theme with and anvil and a horse. Cowboy couple dancing cake topper. This cowboy and cowgirl wrapped with a rope measures 2.5" x 2" x 6". I think it would look good on a western grooms cake also. There are many different ways that a couple can express their personalities through their cake topper from an elegant western dance couple to barefoot and blue jeans. Chances are that yall are a little of both so I put these two together with the idea of using one for the wedding cake and the other for the grooms cake. This cake topper with a bride and cowboy groom is hand painted porcelain. This may be more your personal style and it would be so cute on top of a wedding cake or grooms cake. A western theme can have some bling. 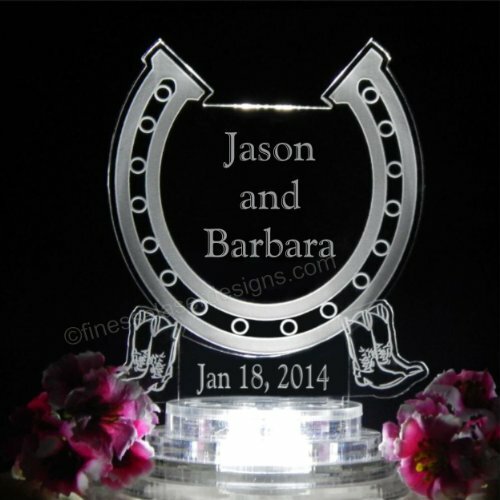 This is a real cute double horseshoe design cake topper with boots hats and rhinestones. Here are a few more cake toppers that I found recently and added them to this page. This one is made similar to the Getting Hitched cake topper shown above. This on has a kissing couple with cowboy boots and a bale of hay. The bride and groom both have on cowboy hats. This wooden silhouette cake topper with a cowboy, cowgirl and horse can also be ordered in acrylic. 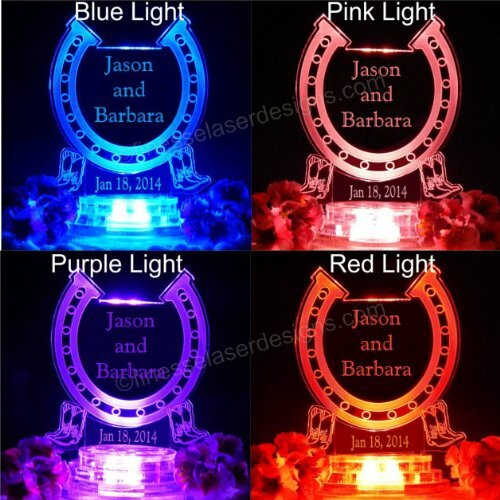 A horseshoe topper made of mirrored acrylic. ​It includes cowboy hats and feathers. This is a wooden horseshoe accented with cowboy hats. ​is 8 1/2 inches tall. The heart with ropes and cowboy hats cake topper is made of resin. Here is a pair of hand embellished rubber Clydesdale bride and groom horses. 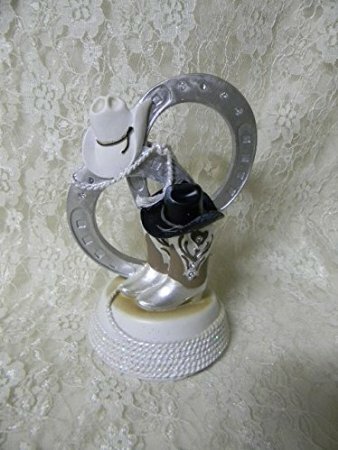 The cowboy and cowgirl dancing cake topper is made of acrylic. it can be ordered in different colors by e-mailing the maker. Funny Rustic Celebration Dancing Cake Topper, Wedding Cake Topper Silhouette Groom and Bride, Acrylic Cake Topper Cowboy. The cowboy and cowgirl with custom name can also be ordered in different colors. Custom Mrs&Mr Name Wedding Cake Topper, Cowboy Bride and Groom Silhouette Cake Topper, Unique Cake Topper. You might like these lighted wedding cake toppers. The ones below are made of acrylic. This design with a horseshoe and cowboy boots will be a unique way to top off your western wedding cake. Forget the ball and chain decoration like I had on the grooms cake at my wedding. I don’t know if your partner came willingly or you had to rope him and drag him to the church, ha ha, but there are some really cute western figurines that can be used to top off a grooms cake. This is a cute topper for a western grooms cake with the girl having roped her cowboy. I really like this cake topper with the cowgirl on a horse roping the groom. It is made of acrylic. Have a look at how this cowboy hat was put together. There are lots of videos on you tube that show cool western cakes in the making. You can get step by step instructions on some of them or just have a look for ideas that you can take to someone and have a cake made. These are edible icing decorations that you simply add to any homemade or store bought cake. They come in different sizes for different shaped cakes. You can submit a photo to go in the center or leave it blank. You can read more details on ordering, how to apply it to a cake and all the particulars on the ingredients. It's gluten free, kosher and more.